Established in 1889 when a full time pastor, Father Daniel Finkenhoeffer was appointed. The church was dedicated on the Feast of the Assumption, August 15th, 1892. Methodism began in the community in 1877, but it was 10 years later that the church was built on the corner of Broadway and Willow Streets. Shown here is a scale model building done by Dave Albrecht. Shown here is a picture of the original Constitution of St. Peter's German Lutheran Church, which was adopted on July 21, 1887. The Presbyterian Church was established in November 1885. It was located at Garfield and First Streets. 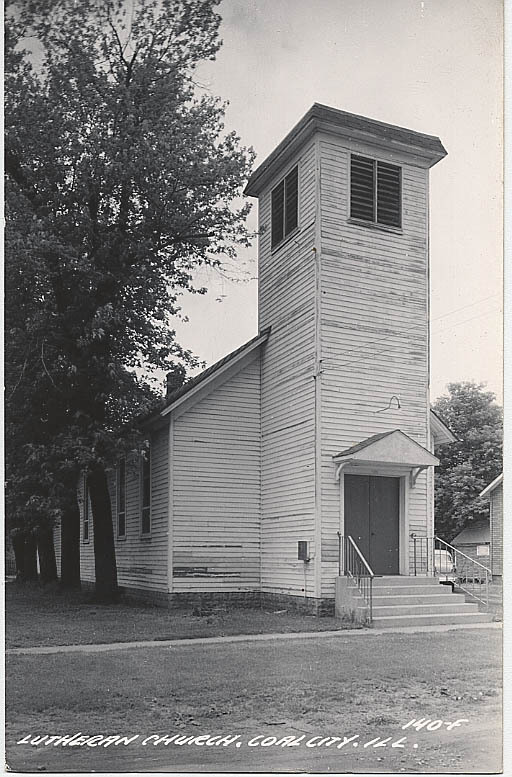 The church was located on the corner of First and Shabbona, and dedicated in 1888. Unable to afford a full-time parson, the church closed in the 1960's. The building was later purchased by the Baptists.